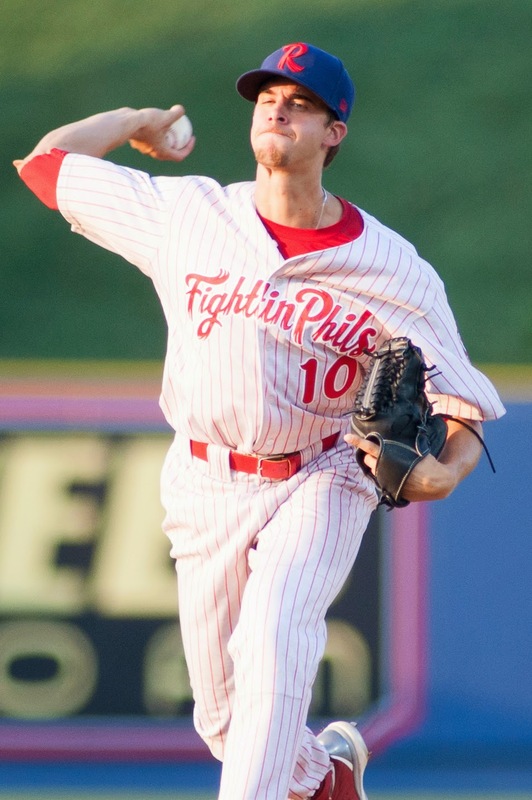 The Phillies' top pick from this year's draft, righty hurler Aaron Nola, has looked very good in the early stages of his pro career. In nine games combined in the minors, the 21-year-old LSU product sports a 3-3 record with a 3.35 ERA while striking out 36 batters and walking seven in 40 1/3 innings. Over the weekend, I spoke with Nola, who was recently promoted to Double-A Reading, about his draft experience, the possibility of being shut down before season's end, the transition from college to the pro's, looking up to his brother Austin and more. Read ahead for that full interview. -What was your draft experience like? How did you celebrate? We had a party over at LSU in our lounge and it was a bunch of family and some friends over there. We had about 100 people actually, so it was pretty big. It was fun. It was a fun time and it's definitely something I'm going to remember for the rest of my life. The draft and getting picked early by the Phillies. -How do you think pitching at LSU prepared you for your transition to the minor leagues? It prepared me, man. I'm glad I went to LSU. I matured more. I matured on the field. Also my physical and mental ability rose up in college, you know, you see a lot of older guys that I'm playing against right now, 23 to 26 year old guys, and I feel like a lot of the guys I played against in college are in high A. I haven't seen too many in Double-A, but I saw a lot of guys down in Clearwater that I played against one, two or three years in college. -When you were drafted there were experts that asserted you'd be one of the first players out of this year's draft to reach the majors. What does that type of forecast mean to you? It's good to me that they have that much confidence in me. I'm just going to try to work my hardest to move up each level, but I'm focused on Double-A right now and, you know, where ever that takes me, that takes me. I'm just focused on each start here right now, trying to get better each start. -Has the transition from college to being a professional pitcher been what you expected? I knew it wasn't going to be easy. I knew it wasn't going to be a breeze. It was different in college. Things change. You get your new teams, new hitters, new everything. New fans, new crowd, different levels, you know, you got bigger crowds, smaller crowds. In college, we always had a big crowd. That's my biggest adjustment right now is moving levels and meeting people. I'm meeting a lot of guys with each club and they give me a lot of tips, a lot of older guys that I can take tips from. -What are your thoughts on the coaches here in the Phils' organization thus far? I'm anxious to work with them more and more as this season goes on and as this season finishes and then next year. That's another big thing, as you move levels you meet new guys and you meet new coaches, new strength coaches and new trainers. You've just got to take everything, all the tips they bring you and you put them all together. -Some people suspect that the Phillies may wish for you to stop pitching before the end of the season to limit your workload. If that's the case, would you be on board with that decision and how much input do you think you'd have? If they want me to go three more starts, 170 innings, that's fine with me. I can do it. But, you know, whatever (the Phillies) want me to do, I'm going to agree with them and I'm right with them on their decisions. -Who were some of your favorite players to watch as you were growing up? I just like watching a lot of pitchers, a lot of baseball and a lot of games with my brother, he's a couple years older than me and he's played ball a little longer than I have, so I watched a lot of his games, but, you know, Pedro Martinez is one guy that I liked. I watched a lot of videos with him and then Mike Leake. We're kind of similar guys, he has my kind of arm slot, so I kind of pick items from them and add them into my arsenal, stuff like that. But at the end of the day, I'm myself. I go out each time and do my thing, do what I know and what I can do.